In the electronics industry today consumer demand for devices with hyper-connectivity and mobility has resulted in the development of a complete system on a chip (SoC). Using the old ‘rule of thumb’ design methods of the past is no longer feasible for these new complex electronic systems. To develop highly successful systems that meet the requirements and quality expectations of customers, engineers now need to use a rigorous, model-based approach in their designs. 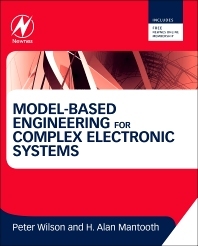 This book provides the definitive guide to the techniques, methods and technologies for electronic systems engineers, embedded systems engineers, and hardware and software engineers to carry out model- based electronic system design, as well as for students of IC systems design. Based on the authors’ considerable industrial experience, the book shows how to implement the methods in the context of integrated circuit design flows. Dr. H. Alan Mantooth is a Distinguished Professor of Electrical Engineering at the University of Arkansas (UA) and holder of the 21st Century Endowed Chair in Mixed-signal IC Design and CAD. After receiving his bachelor’s and master’s at the UA in 1985 and 1986, respectively, and his Ph.D. from Georgia Tech in 1990, he worked for Analogy, Inc. for eight years as a modeling engineer before returning to the UA. He has published over 200 refereed articles on IC design, CAD, modeling, and power electronics, holds three modeling software patents and has published two other books. He is a Fellow of the IEEE and a member of Tau Beta Pi and Eta Kappa Nu.